Environment matters. As people arrive at your event the physical space starts to tell the story . . . it engages the imagination . . . it tells people that something special is coming . 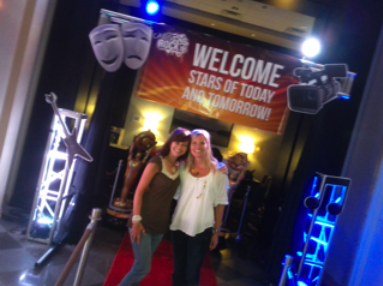 . .
My wife, Christine (left) with her friend Colleen after setting up the entrance to Camp Rock. I’m a believer in focusing your environment spending in the few places that make the biggest impact. Rather than spreading your limited resources all over your entire space . . . narrow the focus of your “plusing” on a few locations where it will be most noticed. There are a few spaces where our team focused our environment upgrades for Camp Rock . . .
Red Carpet Entrance – As kids arrive they are greeted with a red carpet, great lighting, trussing, oversized graphics of the various areas of camp, and a huge banner that reads “Welcome Stars of Today and Tomorrow!” We focused on this area because parents see it every day as they arrive . . . we want to make sure parents know that we’re putting extra effort into serving their kids! We also focused some “welcoming programming” in this space every day as well . . . music pumping, paparazzi, temporary tattoo parlor, crazy hair stylists . . . all contribute to make this a fun welcome to a new a day! Main Stage – Our programming starts and ends the day with a main session . . . this includes a band, funny skits, singing, dancing, games . . . it really is a fun time! We also themed out this area because the whole camp is spending time in here and it sets the pace for the day. We had stars hanging from our truss, a large camp logo, massive stars that represented the various areas of camp . . . plus some special light programming by our media. What about the other spaces? They are clean and functional with good signage but not totally decked out. [See the green screen room.] [See the improv room.] I’m a believer that in kids programming that themeing needs to focus on the areas seen by parents. Often kids ministry people will put their most creative stuff up in their “functional” spaces . . . but then parents don’t see it! You are missing a chance to communicate to parents how you value family ministry . . . if they never see the good stuff happening in there they won’t know! My conviction is that after the first few encounters with an environment the space just becomes “background” for kids . . . and the staff and programming have got to pick up and engage your students. However . . . parent’s love seeing a well themed space for a long time . . . it communicates care for their kids.